Darmstadt goes Dutch with DCE cycling expert Stefan Bendiks on November 9th 2018. To overcome this impasse Stefan Bendiks presented innovative urban planning solutions from the Netherlands, which could serve as inspiration for cycling in Darmstadt. He showed that it takes innovations and experimentation to make a change, and even more to make that change quickly. A change not only cyclists will profit from, but the city as a whole – and even the motorists, that still have to take the car. Surprise! bicycle-friendly Netherlands is also a great place to be a driver. The bottom-line of the talk was that cycling can improve many aspects of urban life. After all, going Dutch on cycling is not about the bike, but about the quality of our cities. A summary of the lecture and discussion can be found on the ADFC website. 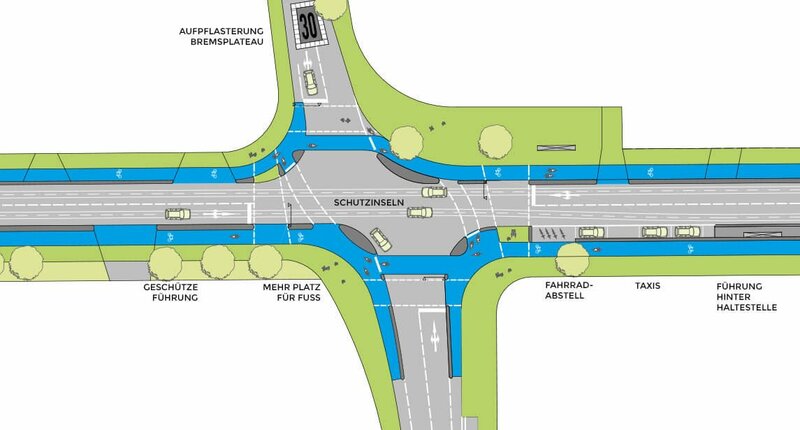 As a first result, a draft of the possible redesign of an intersection in Darmstadt has been made.